Our Community Emergency Response Team (CERT) has been a big part of things over the last year. As the amateur radio Emergency Coordinator for ARES/AUXCOMM here in Klamath County I am parallel to the CERT Coordinator though most of our active volunteers are involved in both so we have been working on division-of-labor concerns and coordinating activation, reporting, and assignments. We also had some administrative changes with Emergency Management being reassigned under the Sheriff. So far it seems to be a good move. One thing I just found out about is an asset being transfered to CERT/AUXCOMM. We are getting an old ambulance to build into a mobile radio and CERT response vehicle. We have a trailer, but there are advantages to having a ready to roll vehicle with a giant generator at the front end. The story of this asset will develope over time. We still don’t have a timeframe for the transfer. Rebuilding the KBARA packet infrastructure took up a lot of time last year. It has been running stable and continuously since my last post with minimal maintenance required. 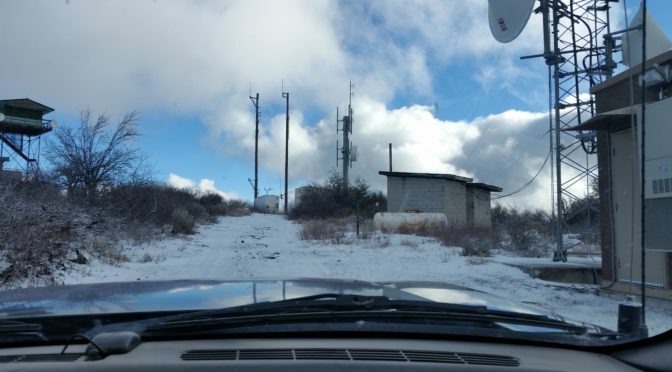 Our mountaintop sites weathered the winter season well and we are working on several new projects that rely in part on this packet infrastructure. One such project is getting a full-featured Winlink amateur radio gateway up and running. The Civil Defense Communications Auxiliary, more on this in a minute, just installed a packet gateway accessible to much of the county. The gateway is hosted by the Sky Lakes Amateur Radio Association who’s assets are provided by the Sky Lakes Medical Center, relies on the KBARA packet infrastructure, and provides Winlink email access to the entire emergency communications community and the ham community in parts of northern California and southern Oregon. A great cooperative effort that benefits a lot of people. The project is not completed this is just the first stage. Next up is adding HF access, and ultimatly forwarding email by radio-internet combinations or by radio only in emergencies. This project is a huge asset that covers a large area and fills a big need. CDCA is one of my big projects. It was set up as a 501(c)(3) non-profit the Civil Defense Communications Auxiliary. Its purpose is to provide material and training support. The Sky Lakes Gateway Project is a good start. Many more projects too come. Volunteer Examiner sessions have been sparse with only one session per quarter. I miss doing them more frequently. One of the things I spent a lot of time on this year was getting authorized as an ARRL emergency communications Field Instructor and Field Examiner. This is primarily for ARES which has been going through a lot of changes this year. I recently qualified as a mentor/instructor for the ARRL’s online training for the EC-001 Introduction to Emergency Communications course. I have signed up to mentor for the first four two-month class cycles of the new program and am looking forward to the experience. ARES/AUXCOMM is a big topic. The state of Oregon recognizes the ARRL’s Amateur Radio Emergency Service program statewide. Some counties have opted for other organizations like ACES or autonomous organizational structures like AUXCOMM. Within the county, Klamath has an AUXCOMM team but it is at the same time an ARES team. As I mentioned earlier CERT is also a big part of the mix because of the extensive crossover in personnel and assets. This wierd mix has also affected the writing of Operations and Training manuals. After time and energy in both, I have turned focus to the Training Manual by creating a training matrix, then developing a program to meet the modular elements on the grid. Eventually, all of this will be written into a manual. From the Training Manual, the Operations Manual containing only procedural elements. When device specific or asset specific operations that require a check-out will point to the TM in an appendix. Once I get the base manuals written I will post them. This is a long-term project. I still participate in the Nation Traffic System as a local net manager, Net Control Station, and participate in state and regional nets. 80 meters has been crappy over the winter so I have not been able to participate as much as I’d like. This has also curtailed a lot of my general HF operations, and limited Winlink radio access. The poor propagation and a harsh reality exposed by the Fall SET (Simulated Emergency Test) was a major prompt to get a local packet and HF gateway, as well as up our game on the tech for the gateway. One of the things I have been doing more of, particularly recently, is equipment R&R. I have a growing pile of radio gear to go through and reset, repair, document, determine what it is, or combine with other bits for operation. I love doing this but I have little bench space or time to dig into some of these projects, but I will find the time. I ended my last post with “try not to wait four months”… okay it was 12 months. I promis to try and do better.